RAVE is considered the finest glatt kosher caterer, proudly serving the Metro New York area and beyond. Clients truly appreciate our commitment to excellence and fine attention to detail, recognizing that our performance is simply unsurpassed. From elegant venues to casual parties, we pride ourselves on providing personalized attention and care by customizing the affair to capture our customer’s vision. In addition, we are confident that our clients and their guests will walk away from their spectacular event with RAVE reviews. RAVE redefines the difference between ordinary and extraordinary. Our recipe for a successful and most memorable event is incorporating innovative ideas with the freshest ingredients, coupled with the understanding and implementation of our customer’s ideas and needs. We capture the latest culinary trends and designs, creating deliciously different dishes and conceiving magnificent new venues, transforming ordinary parties into RAVE events. Customer satisfaction is always our goal and number one priority. Building a personal relationship with our clientele and capturing their vision is our focus and our goal. We are passionate about producing a flawless event each and every time: from the creative presentation and incredible tastes of the food to the professionalism of our talented team to the seamless flow of the event. 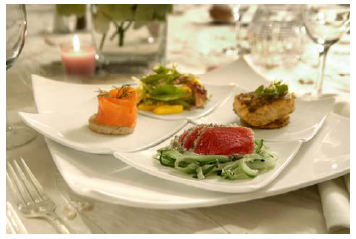 RAVE’s mission is to provide exceptional catering services at an unequivocal value. We are responsible for providing maximum customer satisfaction by delivering first-class service and superb quality products. By meeting and continually striving to exceed our customer's expectations, we provide a strong foundation for return clientele and continue our individual and corporate growth. International Caterers Association Award Competition! We have been receiving RAVE reviews from our customers and suppliers! “RAVE is clearly becoming the caterer of choice for off-premise glatt kosher events in the region”. With every event, we introduce deliciously new food combinations and innovative elegant presentations. Our clients clearly prefer to work with a caterer who demonstrates creativity rather than the standard fare that is commonplace nowadays. It is so exciting to know that we have developed a loyal following. Our standard is consistent high quality with a creative panache, so that our clients understand and expect that every event will be extra special and unique. Our clients become clients for life! Congregation Ahavath Torah is one of the foremost Synagogues in Northern New Jersey. Creative and resourceful planners will design and personalize your event, while our highly-skilled culinary team and professionally-trained waitstaff will provide you with mouthwatering cuisine and superlative service that will exceed your expectations. Conveniently located 5 minutes over the George Washington Bridge, Congregation Ahavath Torah is just 10 minutes or less from Manhattan. With all that the facility has to offer, Ahavath Torah is undoubtedly the perfect place to celebrate your very special day. Thank you for considering RAVE! Proudly serving the Metro New York area and beyond!